Bamboo is the main food source of the giant panda and is extremely important for both captive and wild pandas. A new bamboo planting site in the Wolong Nature Reserve has been selected and the farmers are ready to plant. There are 42 species of bamboo which pandas eat. Each species has a life cycle and will flower and die off every 20 to 40 years depending on the species. Pandas need to have other species available to eat or be able to migrate to a different area when the bamboo dies off. After the bamboo flowers, it can take 4-10 years before the bamboo begins to grown again. In order to more accurately replicate the Giant Pandas' natural habitat, multiple species of bamboo need to be grown. 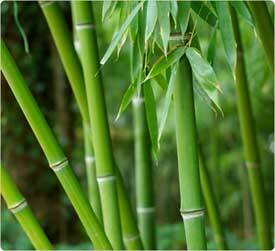 In addition, it is thought that different bamboo species provide various nutritional benefits. Individual pandas seem to have some preferences in the variety of bamboo they select. An adult panda needs 20- 88 pounds of bamboo per day depending on what part of the bamboo they are eating. Pandas are selective about bamboo but all definitely prefer shoots, which at the Centers are used as a treat. Food shortages which result in long distance migrations can cause physical decline in the health of giant pandas, illness, starvation (as seen in the two pandas which were rescued) and potentially death. The earthquake’s tectonic movement and aftershocks are thought to directly or indirectly affect plant growth and development, including the flowering cycle of the bamboo. An earthquake in 1976 caused unexpected bamboo flowering. Bamboo flowering as a result of earthquakes is a cause for great concern. If bamboo starts flowering and prematurely seeding and dying, it will definitely lead to the depletion of food for wild pandas. The consequences of massive, early flowering could be more harmful than the direct impact of earthquakes.